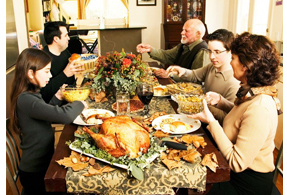 You are here: Home » Learn & Live the Faith » Evangelization » Is Thanksgiving a Time to Evangelize? One of the most intriguing aspects of Thanksgiving is that we give thanks around a table of food with people, typically family members, we may not care for. Though this point may be denied by some, it is fact of life that not everyone gets along. Sin, by our own free will can lead us to do funny things around those we care not to converse with. It seems as if our physical, emotional, psychological and spiritual demeanor goes through a metamorphosis when positioned with family members we don’t agree with on a variety of issues. It never fails that when a family community gathers for a festive event such as Thanksgiving the topic of conversation can only last so long on the weather. The inevitable happens and someone raises an issue about faith, politics, or sports that another family member will not agree with. It’s like the card shark telling the poor sap “pick a card any card.” It doesn’t matter what card you pick, you will end up losing the bet. A point of contention with any family is the state of religion or faith within the household. There are those who are faithful to the Church and attend Mass every Sunday, there are those who don’t. There are those who believe everything the Church teaches and there are those who don’t. There are those who think they have God’s direct line of thinking and let you know about and there are those who confuse Advent with Lent due to the similar liturgical colors. So the question is what do you do? How do you humbly begin to offer an authentic witness of the Gospel without causing evangelageddon in the home? St. Paul in his letter to the Romans serves as a good sounding board when it comes to matters of evangelizing our own brethren. He remarks that the mark of a true Christian is one who is genuine in their love for another. We are called to live in brotherly affection to the point of outdoing the other in honor (12:9). He then takes it to another level where we he urges the faithful to bless those who persecute you and do not curse them (12:14). No one will argue that one of the most challenging groups of people to evangelize is your own family. Why, because they know you, or know the old you. They remember when you were not always “this Catholic” or can recall all of your deep dark sins. Nevertheless, this is an opportunity to provide a genuine witness of faith not by what we say, but instead how we now live. Keep in mind even a mime can effectively evangelize a crowd. St. Paul goes on to say that none of us lives nor dies to himself, instead we live and die for the Lord (14:7-8). The reason for this is that we belong to Him. And if we belong to Him then our actions must be centered on being all things to all men (1 Cor 9:22). So the question then becomes, how do I become all things to my family? The first step is to recognize their dignity as human beings created in the image and likeness of God. It doesn’t mean you condone any aspect of the person’s life that is in contradiction with the Church, it simply means recognize him as God’s child. The second step is to lead him toward a conversation about him and not yourself in light of Christ. Look for the commonalities that actually reflect a genuine Christian life and expand on those and affirm them. Again St. Paul reminds us that our sufficiency is from God and not ourselves (2 Cor 3:5). This means that our actions should be Christ-centered when evangelizing our family members. They should see Christ through us and not just us. The third step is to be at peace with any fruit that comes from the first two steps. Keep in mind that the Catechism reminds us that grace is a participation in the life of God (CCC1996). Our efforts are not an isolated act. Our aim is to introduce everyone into the intimacy of the Blessed Trinity which is what grace does (CCC 1996). If this is the case, which it is, then by nature of our Baptism we are called to share the Trinitarian life with those around us. Thus, Thanksgiving provides us with an opportune time to evangelize and rekindle our Baptismal call.